In Figments of Reality, mathematician Ian Stewart and biologist Jack Cohen's thesis (or schtick) is that human minds are produced by complicity between human brains and culture. In their earlier book The Collapse of Chaos, Stewart and Cohen used the power of Humpty Dumpty to redefine complicity to mean properties that emerge from the mutual interaction of complex systems. "Our minds, our societies, our cultures, and our global multiculture, are all evolving within a reality that we mould in images of our own creation. 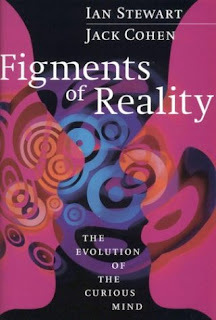 We are a figment of reality--but reality is increasingly a figment of us." Reality is not the only figment in the book. Stewart and Cohen use a group of eight "weird alien beings from the planet Zarathustra, resembling fluffy yellow ostriches but with much stranger habits" as a sounding board, as comedy relief, and as a philosophical-experimental playpen.